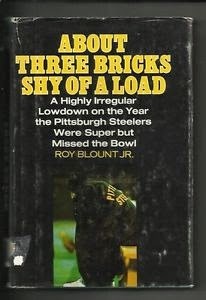 I have been rereading one of my all time favorite books, About Three Bricks Shy of a Load, by Roy Blount Jr. This is an inside look at the 1973 Pittsburgh Steelers. No way could a reporter have the access the Blount did back then. Get this- after practice and before the nightly meetings, the players would race down to a bar a few blocks away and drink as many beers as they could before the meetings. And the coaches knew about it and it was no big deal. Just like today, right? Oh my god, it would be the biggest scandal in the world, although it may pale in comparison to the headlines from today. Blount has an easy to read , self effacing writing style that makes you want to keep turning the pages. Joe Greene, Bradshaw, Stallworth, Bleir, Harris; they are all in this book and young. It's early in their careers. It's a look back at a time when the game was simpler and players were more humble and less important to the "image" of the league. In other words, they were characters. This is a great book. I love training videos. 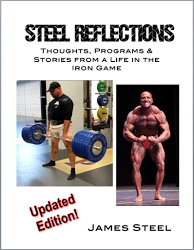 Ever since Pumping Iron I have attempted to find inspiration in what others do in their training . 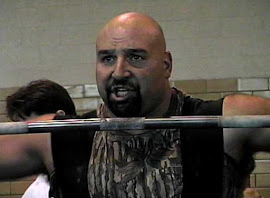 The Ironmind videos of the Bulgarians were some of my favorites. Training in a hall with broken windows and shoes with holes in them. I have a bunch of DVDS's. I usually buy the "Battle for the Olympia" DVD's. Although there is no battle, it's their training. These are always pretty cool. Lots of diet stuff and some good training. 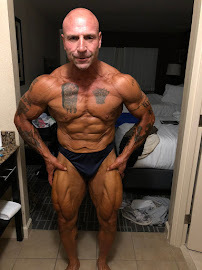 I had some of Nasser El Sonbaty videos and Levrone's and of course, Yates. And a bunch of weightlifting Training Hall tapes. Dymas squatting, Botev squatting. And Botev squatting 720 in China with no belt , just some sweat pants. And they all lifted weights so nonchalantly. Meaning no bravado. Just get up, do it and on to the next set. I have watched Johnny Jackson and Branch Warren train on film before. MuscularDevelopmentcom. has a series of them training on website. So I actually preordered Total Annihilation when I heard about it. Why do I like these guys so much? Because they train hard, man. They tear up the weights something fierce. And you know what else? They train different then anyone else trains. They train with a bunch of rep speed. And what most people would define as sloppy. And they are huge as hell, and pretty much thicker and denser that anyone else out there. So something is working. Yes, I know that they are on drugs. Everyone know that they are on them. And I don't care, it's their business and choice. What I do like is the unbridled intensity. So I get the DVD and it doesn't work on the TV. But when I put it in the computer, it works. Who knows? I didn't feel like sending it back, so I just watched it on my computer. It's good, nothing fancy, some home stuff with both of them, and some crazy training. 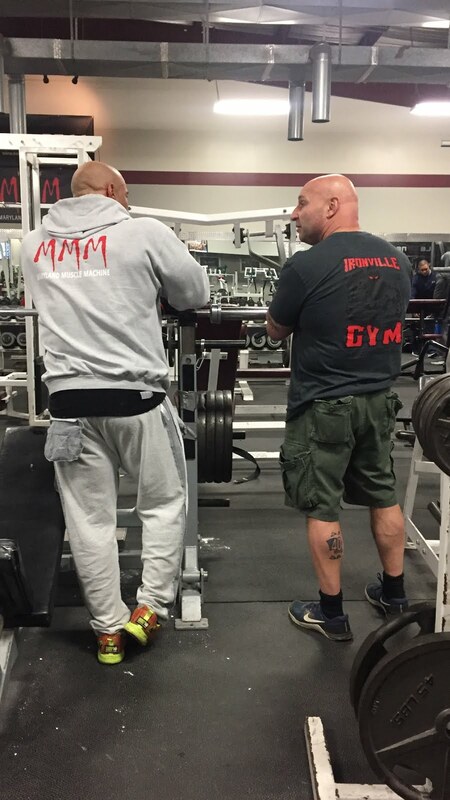 In Metroplex Gym in Texas, loud music, body part after body part, all out training. These guys go nuts when they train. Not with yelling and screaming, but with exercise after exercise with full effort. No talking at all, just getting after it. 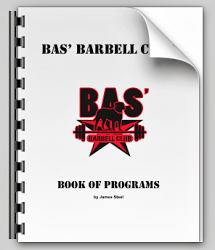 I definitely recommend this DVD for training inspiration. It always peaks my interest about how people train for hypertrophy and what works the best. Slow reps? Lots of reps? Lots of volume? Going to failure? Sloppy form? Precise form? Frequent training? What the DVD shows with these two is that they are covering all bases. Do every damn exercise in the gym and see what happens. With them , its worked for sure. I have noticed over the years a lack of "baseline respect" for authority figures from our youth. A little while back I had to get into it with some punk speeding down my street on his motorcycle and and he actually thought that it was okay to fly down the street while my kids where outside playing. I pointed out to him the error of his ways, but his initial attitude was of a snot nose punk who was gonna tell this old man off. And I learned a long time ago to address everyone older than me as "sir" or "coach". None of this first name crap. I can always tell when a kid is from the South because they usually don't act entitled, they act with manners and respect. I'm just saying, I can tell right away. And they usually look you in the eye when they speak to you. Haha! I couldn't imagine calling my high school or college coaches by their first name. Coach Dailey? My junior college position coach? I can not even think about him being anything but Coach Dailey to me. Hey Mike! Nah, wouldn't happen. Hell, I wouldn't want it to happen. I knew that at 19, I knew nothing at all, and my coaches were there to teach me, not be my friend. I was scared of them, not physically, but they were the coaches and I was the player and that was that. I never even asked coaches, "How was your day today?" Dailey would have turned his head to the side like my Labrador's and said, "What's your angle, son?" You see, most of my coaches were all around good dudes, but it was different back then. What was it? There was a distinct seperation between coaches and players, and not one of the players felt entitled to a darn thing. Of course, in junior college we took our uniforms home with us, had no weight room and no training table, no scholarships and the coaches were getting paid next to nothing. No off season program,no inseason program. No running workouts, no strength coach, no post workout chocolate milk. No inspirational speakers. No music during practice. I don't know how we did it, how we won so many games without all of that stuff. You had to really want to be there. And we still played in a big bowl game even without all the bells and whistle's that everyone has today. And the weights? We just got together and trained. Some in basements, some in Gold's Gym in Wheaton. We really had a team that liked to lift weights. All the basics. Everyone squatted, behind the neck press, bent over rows, some deadlifts, dips, lat pulls, curls. No stretching or any dynamic warmup. Definitely no pilates, yoga, P90X, Insanity....basically whatever Arnold and Kaz and Mike Webster and Randy White and the University of Maryland did in the weightroom, we copied. 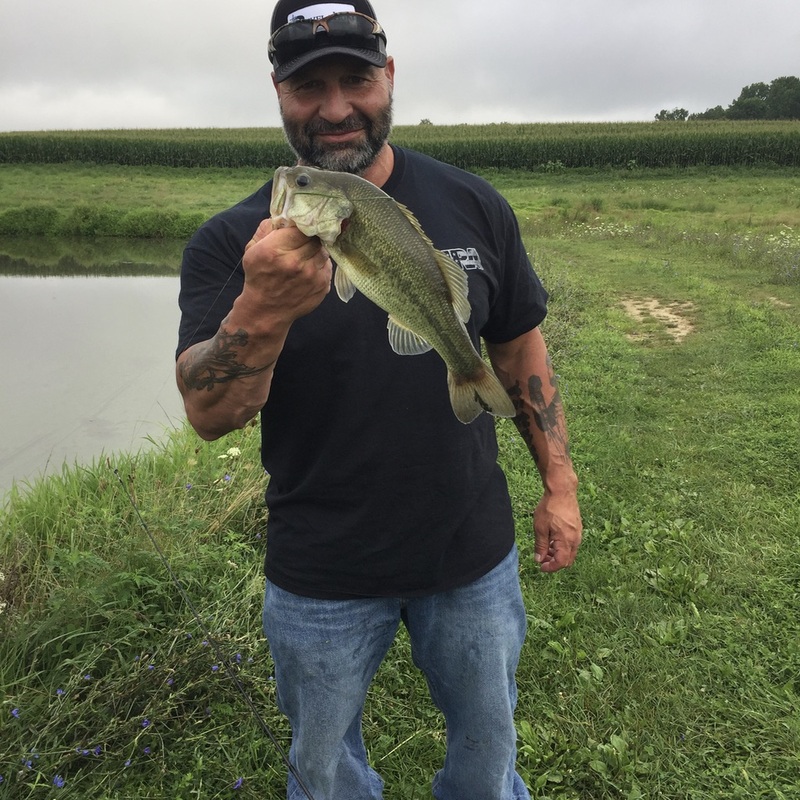 It was actually good to get away from everybody and train alone or with some friends and then go back in August refreshed and chomping at the bit. You wanna play? Be strong and in shape. And if you don't you will be on the bench. Simple. But those days are gone and all in all, I guess that it really doesn't help to rail against it all. It just is. And all you can do is try to control the tiny little circle in which you reside.